Lead with Purpose to Achieve Clarity in a World of Ambiguity In this world of ambiguity characterized by uncertainty, risk, doubt and fake news, now is the time to lead with purpose and bring clarity through data and analytics you can rely on and, most importantly, trust. Data and analytics leaders are driving digital transformation, creating monetization opportunities, improving the customer experience and reshaping industries. At the conference we’ll share new strategies, guidance and best practices to help you realize your future - a future based on data you can trust, agile analytics you can rely on, and the clarity needed to empower you with the continuous intelligence and pervasive insights necessary to excel in the digital economy. 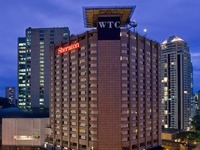 The Sheraton São Paulo WTC Hotel is located in the Southern area of São Paulo, just a few kilometer from Congonhas airport. This hotel has a few different venues suitable for congresses and excellent accommodations. The hotel is located in a neighborhood with relatively good options of restaurants and shops, but if you wouldn’t like to stay in the same hotel where the event is taking place, you will have no problems finding other good options just a few minutes away by car.